Land and sea, headed towards the Orleans Island, Levis, Montmorency Falls, or Quebec Bridge . Combine the historical visit of “Tours Voir Québec” to the discovery of the St. Lawrence River and the maritime Quebec aboard a Zodiac boat in all safety. Astonishment and friendliness guaranteed! At first, you make the Grand Tour that will allow you, in a small group (maximum 15 people) and supervised by an experienced guide, to discover the history, the architecture, and the places of the outstanding Old Quebec. 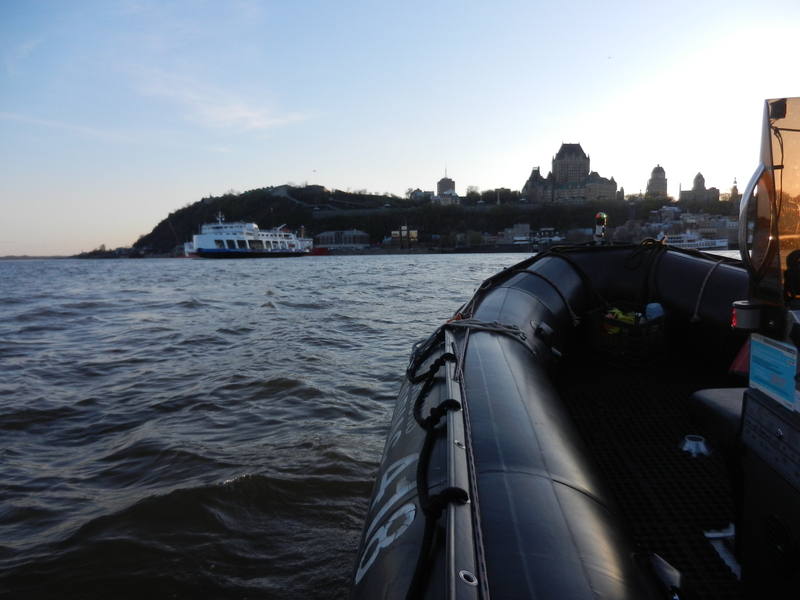 Then go, at your own pace, to the point of embarkation of the Zodiac boat and explore the majestic St. Lawrence River! Sitting comfortably at 45 centimeters from the river, you will enjoy for 90 minutes, like the first comers, the imposing nature of the St. Lawrence River and the heights of Quebec. In addition, you will be able to closely observe: the port of Quebec and the Old Port, the imposing icebreakers of the Canadian Coast Guard and the cruising ships, the Montmorency Falls and the Orleans Island, or the Quebec Bridge. You will live the experience all aboard the Red Zeppelin 1 or the Black Zeppelin 1, duly certified boats, driven by highly qualified captains. Book now! *CHILDREN AND ADULTS WILL ADORE IT! This package allows you to save 10% off the regular price for the Zodiac boat excursion. Book online now or buy it at the “Tours Voir Québec” kiosk, located in the Infotourist Centre (12, Ste-Anne Street), which is the starting point of the Grand Tour. The employee from “Tours Voir Québec” will show you where the embarkation point for the Zodiac boat excursion is when you purchase this package or on the delivery of your voucher if you reserved online. *Children must be accompanied by an adult and weigh at least 18 kg (40 lbs).